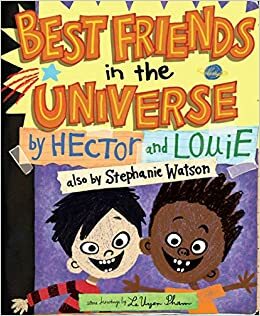 Summary: Hector and Louie are such good friends, they want to tell you all about it, so they’re writing a book called Best Friends in the Universe. Why are they best friends? There are five million reasons! They both want a python; their moms got them both a fish instead (that they both named Python); they both love dance parties and inventing new foods like a peanut butter toast milkshake. They’re such good friends that they know each other’s secrets…like that Louie once wet his pants after drinking too much milkshake and that Hector likes Linda Berger. Uh-oh, they weren’t supposed to say that! Suddenly the best friends are in a fight and not speaking. They’re even writing a book called WORST Friends in the Universe! But after awhile, the two boys realize life without a best friend is lonely. Acknowledging that they are both not the greatest at keeping secrets, they patch up their friendship. The book is over, but their friendship is not! 40 pages; ages 4-8. Pros: Some positive messages about friendship and forgiveness, told with exuberant cartoon bubbles and illustrations that look like kids’ drawings on notebook paper. Cons: A peanut butter toast milkshake?